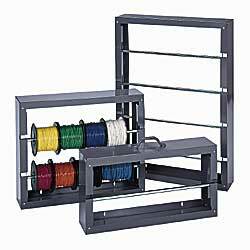 Stores wire spools up to 10" diameter. Plated 5/8" diameter steel axles. Heavy-gauge steel frame is painted with a rust-resistant powder coat finish. Choose single-axle rack with carrying handle, double-axle rack or four-axle rack that holds 20 or more spools. Ships unassembled. Color: gray. FACTORY QUICK SHIPFOB CONNECTICUT. YM-2502 9	 10-3/8"H.	 1 axle	 15	 26-1/8 x 6" x 10-3/8"
YM-2503 11	 17-7/8"H.	 2 axles	 30	 26-1/8 x 6" x 17-7/8"
YM-2504 18	 37-1/8"H.	 4 axles	 60	 26-1/8 x 6" x 37-1/8"